“It’s outrageous,” said one critic, responding to the border agency’s failure to provide documents on caravan surveillance. The nation’s Customs and Border Protection agency (CBP) failed to meet a Thursday deadline to provide detailed information about a controversial program that tracked at least 59 journalists, attorneys, activists and other private citizens connected with the migrant caravan. The deadline was set by the House Committee on Homeland Security. The committee sent the questions in response to an NBC 7 Investigates report on the surveillance program. Rep. Kathleen Rice, D-NY, said it is “outrageous” that CBP failed to meet the committee’s deadline. “We are not asking CBP for ten years of records,” Rice told NBC 7 Investigates. “We believe this caravan surveillance policy has been recently enacted, and there is no reason why CBP should not comply” with the House committee’s request. In a letter to CBP Commissioner Kevin McAleenan, Rice and Rep. Bennie Thompson, D-Miss., who chairs the House Committee on Homeland Security, gave CBP a March 14 deadline to provide the information. NBC 7’s reporting is based on documents provided by a source within Homeland Security. That information confirms the existence of a database created and used by CBP, Immigration and Customs Enforcement (ICE), Homeland Security Investigations (HSI) and agents in the San Diego sector of the FBI. In addition to tracking ten journalists, three U.S. attorneys and 46 immigration advocates and activists, the agencies kept detailed records in the form of “dossiers” about private citizens who the agency had stopped or planned to stop and question. Two former law enforcement supervisors have defended the surveillance as a routine, lawful and important tool in CBP’s mission to protect our borders and enforce our nation’s immigration laws. Peter Nunez, a former border enforcement official in the George H.W. 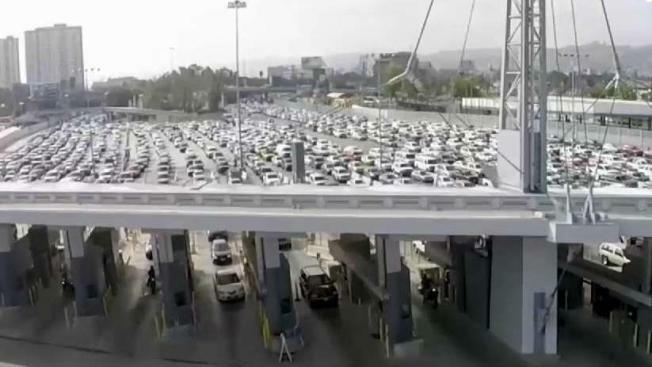 Bush administration, and Alan Bersin, a CBP Commissioner in the Obama administration, both told NBC 7 they haven’t seen evidence of CBP violating any citizen’s rights or misusing their personal information. But Rice harshly criticized CBP’s surveillance and asked the agency to provide detailed information about how and why it has questioned private citizens regarding their knowledge of the caravan's movements and members. The agency did not respond to NBC 7’s questions about why it missed the committee’s deadline and its intention, if any, to eventually provide that information. Speaking with NBC 7 from her Capitol office, Rice vowed to continue pressing CBP for details on the controversial program. To read NBC 7 Investigates’ series of stories on the secret database, click here.